There is a another organ in the Cathedral up over the Gospel side of the altar (on the left as you look at the altar). The architecture of the altar area is in a baroque style quite different from the nave and certainly the outside, which dates back to the 11th-12th century. 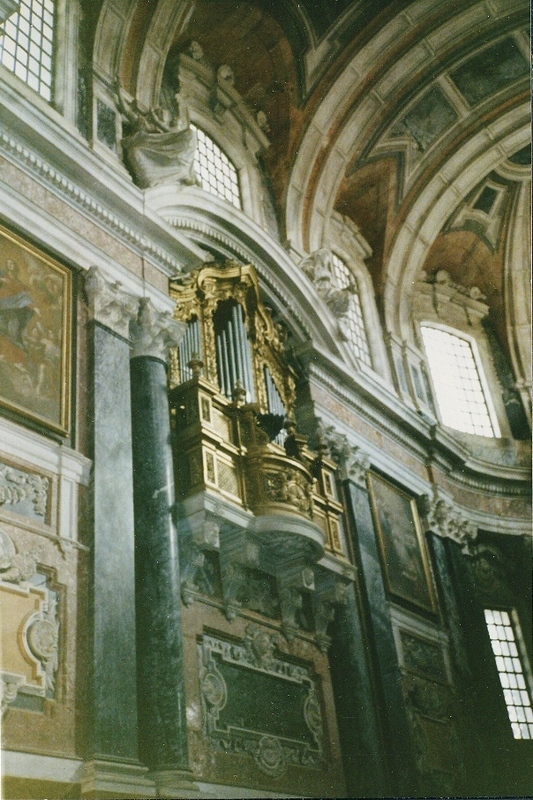 The Gospel Organ was built in 1758 by Pasquale Caetano Oldovini, several years before he returned to add the horizontal trumpets to the Great Organ further back in the nave (1772). This suggests that at least by 1772 both organs might have been in use at the same time. The organ was probably added to accompany the Mass from the front of the church and/or to accompany singers in the matching elevated gallery directly opposite it. If both organs were in use at the same time, the front organ would service the priests & choir across in the gallery and the Great Organ in the nave might be used for processions and to support a larger choir. In its heyday Évora was a great university center and seat of episcopal power. Such grandeurs as fully staffed multiple choirs and organs would have been appropriate to its station. 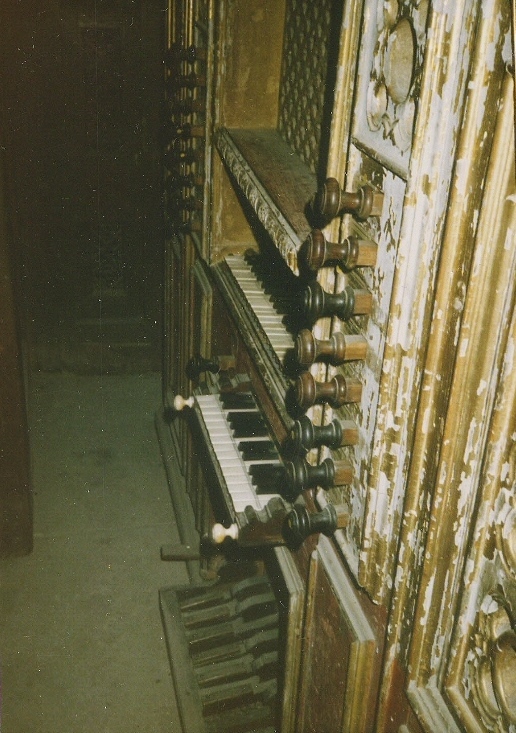 A present-day analogue would be the current music program at Notre Dame de Paris. There the Great Organ is used for processions and in alternation with the organ and choir seated up by the altar about 225 ft away. Grand music for a grand space. The case is beautifully decorated with angels and floral motifs. It sits like a gem in its alcove. 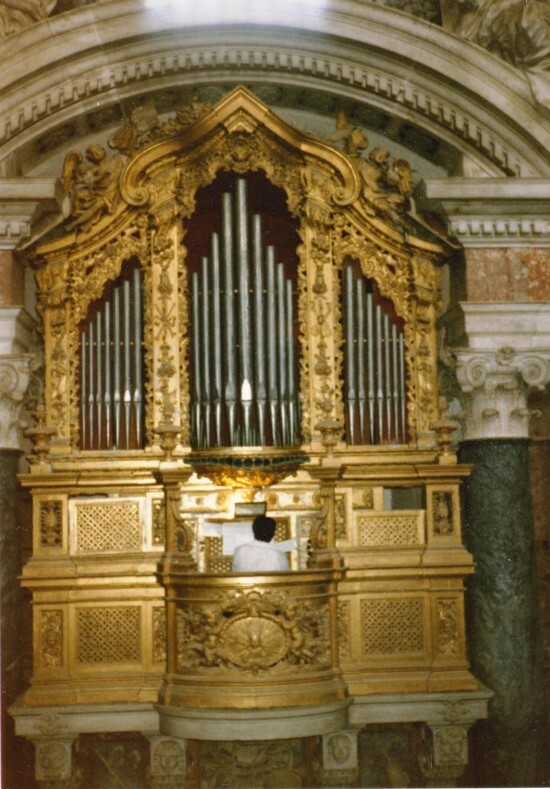 Organist Joseph Bertolozzi on tour for the US State Department at the Gospel Organ of the Cathedral of Evora, Portugal in 1985, the European Year of Music. His repertoire included music by Soler, Seixas, Carreira, Scarlatti, Bach, Gasparini, de Arce, and Bertolozzi. There is only room comfortably for a single person, the organist. The alcove directly across from it (from where this picture was taken) can hold a few singers and as I remember it seems to have been designed for it. The opposing gallery/balcony is architecturally identical except it lacks an organ case. This detail (above) shows the en chamada (or horizontal) trumpets fanning out over the organist’s head. Note they have a rod attached to their tops to prevent them from falling down. 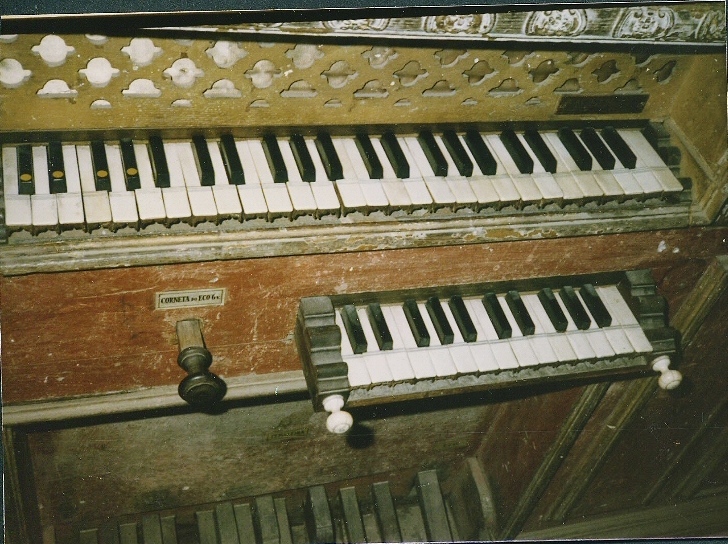 The organ has one manual without a short octave, a pedal board of one straight octave, and divided stops in the usual Iberian manner, but most interestingly has an additional manual hidden in a drawer that slides in and out. 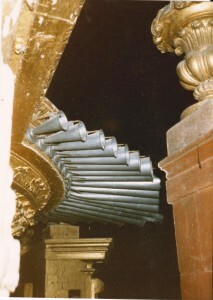 When seated at the organ you see just the white handles sticking out, and the stop knob unusually placed at belly-level. When you pull out the “drawer,” this little keyboard emerges. It remains silent until the stop knob to its left is drawn. 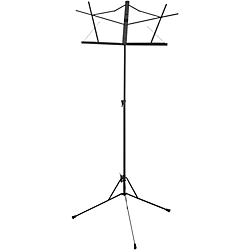 It is a dedicated Echo Cornet or CORNETA do ECO 6v, meaning it has six ranks of pipes playing together at once to create this particular solo voice, both nasal and distant. Listen to it here as I contrast it with a louder but more rounded flute sound. I’m necessarily moving my right hand back & forth from manual to manual. The piece is the Minuet from Sonata em La Maior by Carlos Seixas. The action on all the keys was unusually responsive, unlike any other I’ve played. I mentioned a little something about the choirs earlier on…. We’re now going to go back to the large choir loft over the main entrance near the Great Organ. In fact one has to walk through this area to get to the Great Organ. 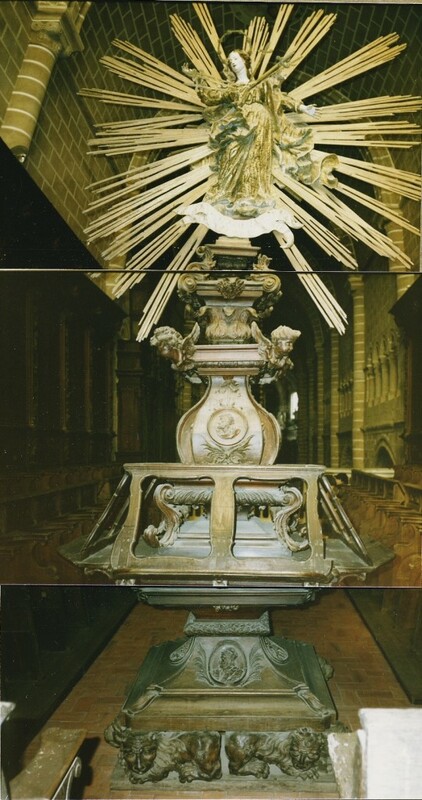 This is a late Rennaisance (on the bottom), early Baroque (on the top) music stand meant to hold books for the choir. There would be a huge book with just the soprano part placed on one side and all the sopranos would gather around to sing from it; the same for the altos, tenors and basses, each with their own book. Here’s an image of such books, several of which happened to be in the very same choir loft a few feet away. 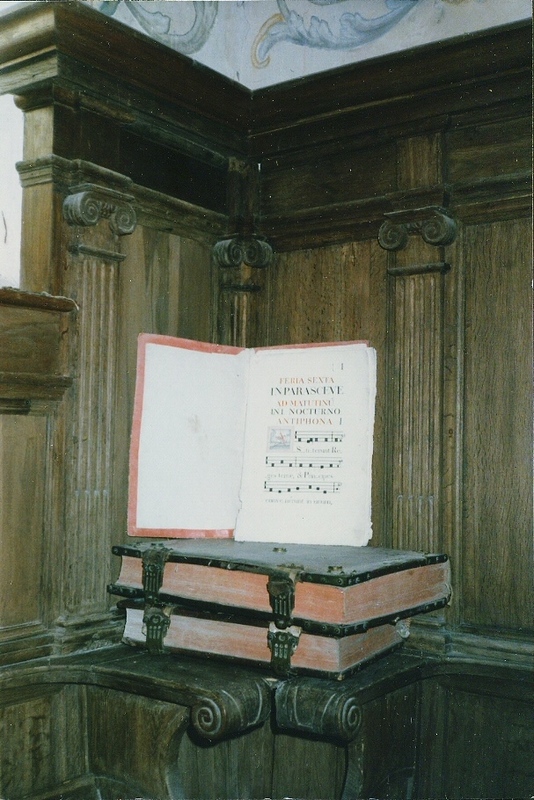 Note the scale of the books: the armrest on the choir stall is large enough for an adult arm to lay upon it with the hand curling over the curved leading edge. That makes the smallest book about 3 ft. (1 meter) tall! These are just one of the many treasures I was able to experience on this tour.